My cats give new meaning to the word "spoiled." 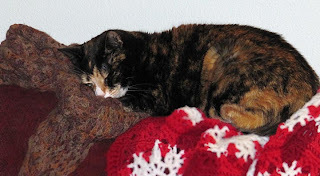 The pillow that Snickers is cuddling into is my hand-dyed, cashmere shawl. At least she has her priorities in order. Her rump is on the acrylic afghan I made more than 30 years ago.